I am NOT a LAWYER or LEGAL advisor. Please research your local/state/federal laws. While giveaways can draw new viewership, it can get you into a legal trouble if you do them improperly. Also, every streaming platform is different, and their rules can change at any time. Please consult your streaming platform’s terms of service documents and get legal advice from a professional. GIVEAWAYS will not guarantee you viewers, subs or tips/donations. Accept this now, or do not do giveaways. They should be looked at as a way to reward your current viewership, and have other potential viewers come by your channel to check it out. Some viewers will only visit if you do giveaways, and if you develop a support base of “giveaway only viewership” you may fall into the slippery slope of feeding the beast. This can result in spending way more than what you bring in, and saltiness for both you and your viewers. Be honest with your viewership; do not set the expectation that you will always do giveaways unless that is your plan. Setting this tone early is important for retaining viewers. Giveaways should be open to everyone. I do not care what loophole you think you read, what scheme method you have seen someone else use, if you do not open the giveaway to everyone and you create a pay wall to enter (subscribers only) then you have created a lottery, and that’s bad news, legally. 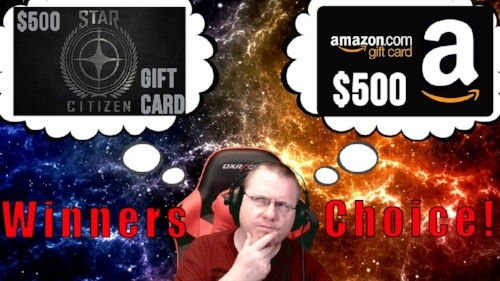 Making the choice of what to giveaway can be a fun interactive process that actually generates more content for your stream, if you let it. You can ask your viewers, perhaps using a straw poll, or use your bot. Just be careful not to let your chat take over all your giveaway decisions, so you don’t end up only rewarding existing members of your channel instead of also drawing in new ones. Another option is to tie your giveaway with the launch or update of a new game or product. Say the latest game is coming out, and you’d like to stream it. Many do, myself included, but, for newer streamers without established communities, this can be hard. If your stream is one of 100 other streams doing the same thing it’s challenging to stand out. Offer up a different kind of prize by focusing on the games that you built your community around, and make your giveaways match. I do lots of Star Citizen giveaways, even when I am not playing it, because that is what I built my community upon. It also helps draw more people into our favorite game, which any MMO group always appreciates. Regardless of the method you use to choose your giveaway, I find it is always a good idea to keep your audience engaged by making the giveaway last a decent amount of time. That’s right; you should milk it. Remember, the entire point is to grow your viewership. Do NOT cave or be pressured by your viewers to give something away immediately; it builds no hype and does little for your channel. I like to make a higher value giveaway that runs for several hours, or do a progression style giveaway where it is comprised of several smaller prizes leading up to a larger prize. This is a good hype builder and gives people a chance to walk away with something. Some streamers may tell you that they do giveaways whenever they feel like it with no real planning or promoting, but leveraging social media and letting your current viewers know what’s happening is almost more important than what you are giving away. Twitter, Facebook, and other platforms let you announce and hype your giveaways outside of the stream, letting your followers know something is happening. Services like GameWisp let you send notifications to all your supporters who use it. It is just as important to notify your current supporters, subscribers, and followers and include them in the giveaway as it is to hope for new ones, especially since, if you are doing it right, they are the ones helping fund the giveaway in the first place. They also bring hype to the channel. The more viewers you start with when you run the giveaway, the higher up the list of streams you are. This is what gets you noticed by new viewers. The more effort you spend on promoting, the better the results when it comes time to do the actual giveaway. You know what you’re giving away, you have promoted it, and now it’s time to stream! Make sure before you hit that broadcast button that you are ready to give the best, most interactive stream you possibly can. Don’t be something you’re not, just give it your best effort. While the giveaway is a great way to draw viewers, it’s your personality and stream that will keep them coming back! For many people this is their first impression of you: make it count. Remember to set the tone whether these giveaways are something you do on a regular basis or just an occasional thing. When viewers first hit your channel is the time to set their expectations, so that you deal with less disappointed viewers later. Okay. Stream is over and it was a blast! You got some new followers or subscribers. You have the winner’s (or winners’) info to send the prizes. Do this ASAP! People love it when they get their winnings right away. Remember to announce your winners through tweets and show bits of the stream in Twitch clips. The post-promotion gives people a glimpse of the fun they missed and builds hype for the next event. Keeping that audience engaged is important in retaining their viewership. Most importantly, take a self-assessment. Did you have fun? Is this something you want to do again? Giveaways on stream are not for everyone. Some people enjoy doing them while others find they kill their stream’s flow. To each their own, I say, but when done right they can be powerful in growing your channel. Be sure to check out Mitauchi's stream, here, or check out his giveaways page to see first hand how he does his thing. You can also find him on Twitter.